The Yogis believe that the sound of creation is the mantra “OM”. Yoga has long utilised the method of sound and vibration as a form of harmonising the individual with the cosmic reality. This has been done through the techniques of mantra, vibrational pranayama such as Brahmari, and many more. In fact, all of the yoga techniques put us in touch with the innate vibration of the body – the basis of all life. Once we come to understand this vibration and work with it, we can become conscious creators of our reality. 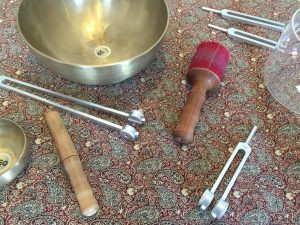 At The Yoga Shed we’ve brought together the science of yoga with the sound healing tools of singing bowls, gongs and tuning forks to induce a wondrous experience of profound peace, harmony and relaxation. The sounds act directly on the cells of the body and the brainwaves, allowing one to passively enter a state of deep stillness. From within this state the body’s natural ability to heal is enhanced. Emotions are calmed and mental distractions are cleared away, thereby inducing a state of clarity.